Influential? That’s one of the superlatives I’ve read and it’s one of the few I’ll take exception with. Sure, while watching it I did imagine it was like what people felt when watching “Oklahoma” or “West Side Story” for the first time but I’m not sure influential is the right word for any of those (maybe “Oklahoma”). It’s more that you’re seeing a demonstration of the finest a genre is capable, a work that honors and challenges the form, stretches it in unexpected directions while leaving the basic outline intact. But do I want there to be 100 more rap musicals? Not so much. Five or six good ones would be okay. 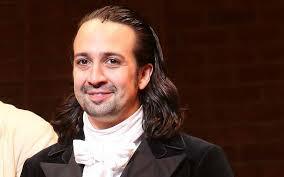 My Lin-Manuel Miranda Man Crush. The courage to have come up with this concept of a musical about a Revolutionary War hero told through contemporary idioms and with diverse casting! The talent to carry through on it (those songs!) And still young, young-ish, what is he, 35 or so? He’s not in the show anymore, and though the actor I saw play Hamilton (Michael Luwoye) was great I don’t think this is a show that you come out of thinking about the performances as much as the creative force behind it. They should just drop a big poster of Lin’s face during curtain calls so we could clap for him, every night. Album vs. Live. Yes, I know people pay thousands of dollars to get a seat and God bless them if they have the money but in my opinion listening to the cast album took me 75-80% of the way there. You lose some of the emotion of seeing the songs delivered by real people and some of the urgency of the the staging, but the songs are so good and the arc of the story so compelling you don’t necessarily need to be in the room to get the a large part of the experience. But, you know, do go if get the chance. Goosebump Moments. “My Shot,” a moment where even though I knew what was coming I still found myself surprised and amazed by what I was seeing and the thought behind it, and “It’s Quiet Uptown,” which killed me when I heard it on the album and destroyed me live. Special mention too for “The Schuyler Sisters,” which didn’t stand out for me when listening but was was completely charming live. Even the minor characters get great songs! How did Lin-Manuel do that?